With winter comes cold and flu season. 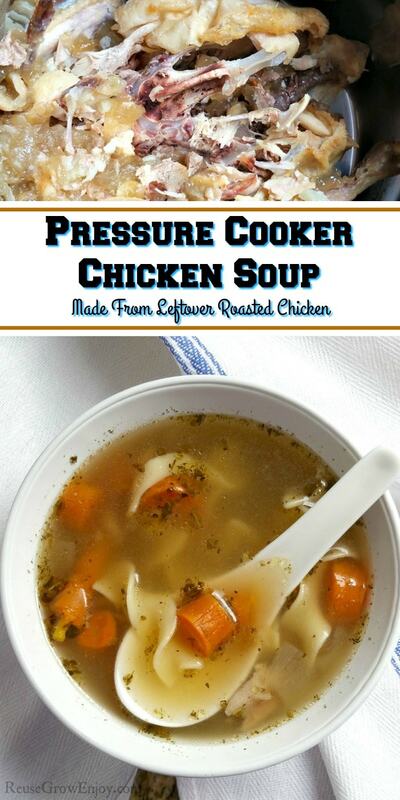 If you are looking for a homemade pressure cooker chicken soup recipe to try, this is easy and oh so good! It is also a great way to get the most out of your chicken. What do you do with bones from a roasted chicken after you are done? Did you know you could stretch it over into another delicious meal? 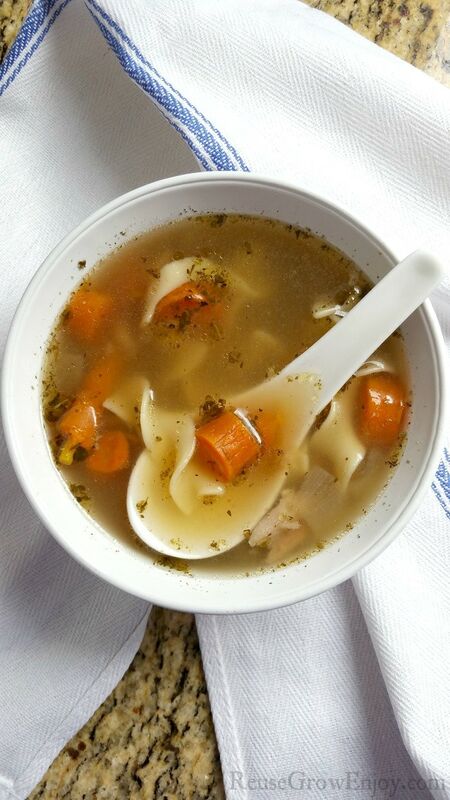 I am going to share my recipe for homemade pressure cooker chicken soup made from leftover roasted chicken. While I made this recipe using leftovers from a whole roasted chicken, it could be made using any bone-in chicken. Such as breasts, thighs, and legs. 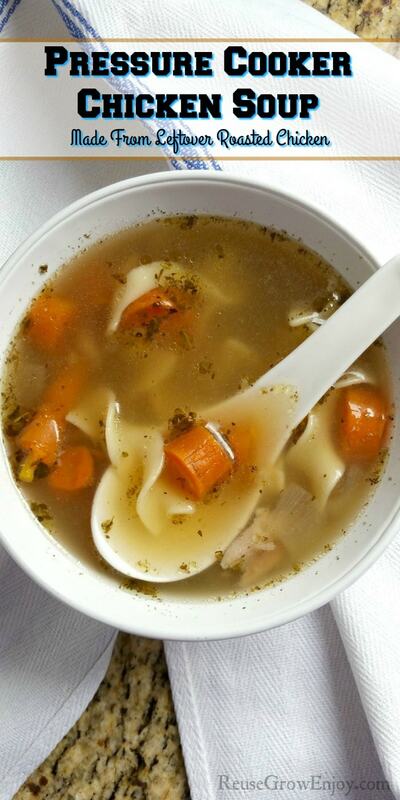 The bone helps to give the broth the amazing flavor you enjoy in a hot bowl of chicken soup. If you do not have a ton of meat left on the bones, that is ok. You only need a little to make the soup. I only had about 6 ounces of meat left on mine and it turned out great. If you did want extra meat you could also toss in an extra piece of breast or leg if you wanted. It could be uncooked and would work just fine. The first thing you want to do is after you have had your chicken meal is decide if you are making the soup right away or the next day. I made mine the next day. So I just allowed the chicken to cool, then wrapped it and the drippings up and put in the fridge. Feel free to change things up a little if you want. If you do not like carrots, you can leave them out. Or, if you don’t want extra carbs, you can leave out the noodles. This soup also goes great with homemade garlic bread. The jelly looking stuff in the picture above is the drippings after they have been chilled. I saved all of it from when I roasted our chicken the nite before as it helps flavor the soup. If you are looking for some other dishes to warm you up, here are a few to check out. With winter comes cold and flu season. 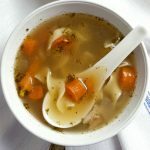 If you are looking for a homemade pressure-cooker chicken soup recipe to try, this is easy and oh so good! It is also a great way to get the most out of your chicken as this is made using leftover roasted chicken. 11.5 Oz Oven Roasted Carrots thick sliced, can also use raw, see instructions below. Add chicken, water, pepper, seasoning, garlic, onion, and salt to the inner pot of the Instant Pot. If you don't think your chicken has enough meat left on it, feel free to add in a leg or breast. It can be raw. Place the lid on the Instant Pot and make sure the valve is on seal. Push the manual button and add a cook time of 30 minutes. If you are using raw carrots for this recipe, only add a cook time of 20 minutes as you will need to add the carrots in for the last ten minutes of cooking. So after the 20, you would need to add the carrots and then cook another 10 minutes. After it beeps that it is finished, open the valve and allow it to fully vent then remove the lid. 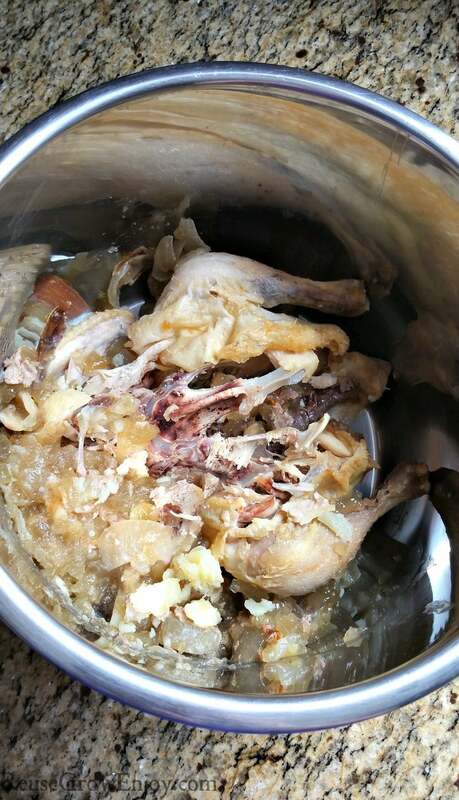 Remove the chicken from the broth and place in a large bowl. Be sure you get all the bones. If you are worried you may miss some, you could strain the broth and then add it back to the pot. Pull of chicken from bones and add the meat back to the broth in the pot. Then add in the roasted carrots (unless you used raw then they should already be in the broth) and noodles. Put the lid back on the pot and make sure the valve is on seal. Push manual and a cook time of 2 minutes. When it beeps, open the valve and allow to vent. Then serve! I love using oven roasted carrots in this as I feel it just gives it added flavor. So what I do is just toss in some extras when I roast my chicken for the meal the night before.